A couple of weeks ago I was looking around for some Pomegranate Molasses - an ingredient I had heard of and tasted a couple of times and that I was wanting to experiment with. Even though I live in an area full of Lebanese shops, I had no luck in tracking it down. So I decided to go to the source of my curiosity and inspiration and order online from the Ottolenghi shop in London! So I made a gift to myself and when the package arrived it was the most beautiful experience. Aleppo Chilli, Dukkar, Pomegranate Molasses and.... a new cook book! 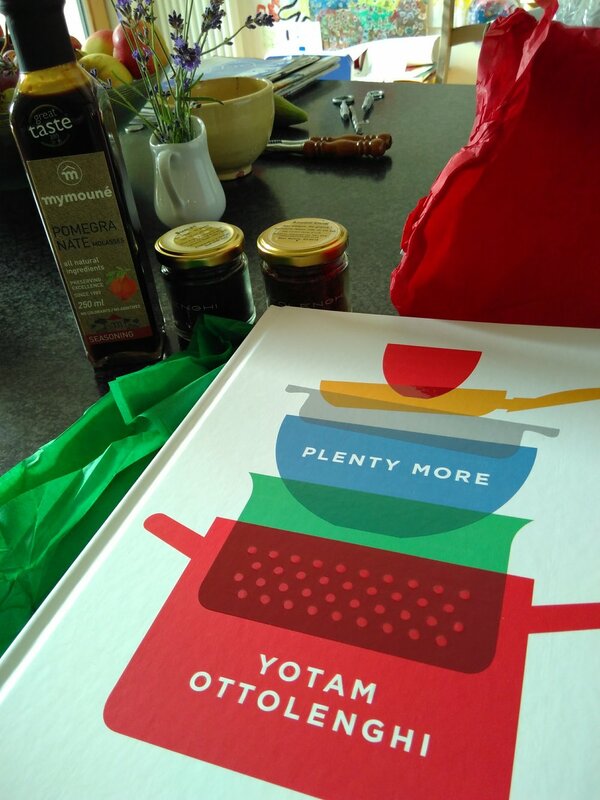 Yotam Ottolenghi is as passionate about plant eating as I am - he is not vegetarian or vegan he just believes that there is so much more to discover in the plant world in terms of tastes and textures than has been explored to now.... it is not just tasteless tofu and a heap of old lentils! I loved reading the forward to the book and learning about his process of building recipes - which resounded a lot with me - something along the lines that there is not a lot that can't be fixed with a squeeze of fresh lemon juice, some chopped coriander or a sprinkle of feta! The whole process of receiving this gift to myself was fantastic and having friends around this weekend to test out a few recipes on them... more joy!